"We choose the parents in this life that can teach us something, so that when we go into the next life, we get it right. Of course, sometimes it don't work, does it?" Some films are so intimate, so emotionally raw and natural, the boundaries of the screen evaporate and the audience feels like a peeping tom spying on real life. Secrets & Lies is that kind of film. Writer-director Mike Leigh's mesmerizing interpersonal drama immerses us in the frustrated lives of a dysfunctional British family, but they might as well be the people next door. Although the situations they face may not be universal, the way they choose to confront or evade them is, and those sparks of recognition lend the film a marvelous immediacy that more than compensates for its minimal plot. Just watching these characters sit and talk is flat-out fascinating, but learning the actors improvised much of the dialogue makes one doubly appreciate the film's remarkable craftsmanship. From the moment this masterful work begins, it transfixes the viewer, and despite slow pacing, Secrets & Lies keeps us enthralled for almost two-and-a-half hours. With a deft touch, Leigh mixes comedy and pathos�often in the same scene�as he tells the story of Hortense Cumberbatch (Marianne Jean-Baptiste), a sophisticated young black woman who decides to seek her birth mother after the death of her adoptive parents. An optometrist by trade, Hortense hopes to get a clear view of her own existence, but her fairy-tale vision becomes blurred when she discovers her mother, Cynthia Purley (Brenda Blethyn), is a pitiful, lower class white woman. Cynthia (who has no idea Hortense is black) initially rejects her sight unseen, but soon consents to a meeting, and after accepting the shocking reality of Hortense's race, the two develop a relationship that becomes more satisfying and nurturing than the one Cynthia shares with her other grown daughter, the petulant, resentful Roxanne (Claire Rushbrook). Meanwhile, Cynthia's brother, Maurice (Timothy Spall), a successful portrait photographer, tries to manage his own existence amid the wild mood swings of his uptight wife, Monica (Phyllis Logan). Maurice hopes to ease family friction by throwing a 21st birthday party for Roxanne, but when Cynthia shows up with Hortense, years of suppressed bitterness bubble over and brutally expose a lifetime of secrets and lies. The film's provocative title masks a simple central theme�the pursuit of love and acceptance. When all is said and done, the characters want little else, yet they express that visceral desire in vastly different ways. The outspoken Cynthia wears her heart on her sleeve, and the circumstances of her sorry existence provoke numerous bouts of blubbering that evoke a mixture of sympathy, irritation, and embarrassment in those around her (as well as the audience). Maurice, on the other hand, spends his days coaxing smiles from his photographic subjects, but his gentle prodding proves futile in uniting the three stubborn women who rule his life. Like many Brits, he represses his emotions until they eat away at his insides�a quality his wife shares, except when acute bouts of PMS transform her into a crazed harpy. The introspective Hortense seems the most stable, but possesses far-too-rosy expectations regarding her assimilation into a family she knows nothing about�and who don't even know she exists. During filming, Leigh employed several creative methods to challenge his actors and heighten realism. He didn't allow Blethyn and Jean-Baptiste to meet until their characters did, and never told Blethyn that Jean-Baptiste was black. Whether such manipulations enhanced their performances remains open for debate, but what's indisputable is the superiority of their work. Rarely have I seen two more natural, spellbinding portrayals, both of which rightfully earned Oscar nominations. The needy, slovenly Cynthia is both heartbreaking and annoying, and Blethyn beautifully embodies both characteristics, challenging us to embrace this pathetic woman despite her multitude of faults. As the confused and conflicted Hortense, Jean-Baptiste exudes a subtle radiance and child-like innocence beneath her confident Yuppie exterior, and we admire her determination to pursue her heritage despite its unconventional elements. In their scenes together, both women enjoy an uncanny rapport, and their depth of talent is never more evident than during a critical dialogue filmed in one sustained take lasting eight�yes, eight�minutes! Few directors would ever attempt (or consider) such a stagy presentation, but Blethyn and Jean-Baptiste are so riveting, Leigh pulls it off, and makes us barely aware of the take's duration or static nature. Watching it unfold, it's impossible not to believe we're witnessing the evolution of an actual relationship rather than two accomplished actresses performing a scene. 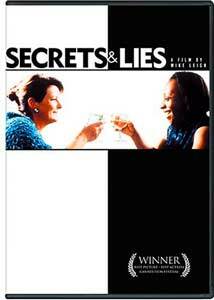 Leigh draws equally realistic portrayals from the rest of his fine cast, and though his directorial style flaunts not an ounce of flashy technique, Secrets & Lies still enjoys a lovely cinematic look. The lengthy takes heighten the sense of truth and forge us deeper into the characters' heads, while the urban London locations lend the film an edgy documentary feel. Some have likened Leigh to Woody Allen or Ingmar Bergman, but Secrets & Lies lacks the affectations and idiosyncrasies that often mark the works of those legendary directors. With little flourish, Leigh creates a film that's straightforward, funny, often tough, but immensely satisfying and ultimately uplifting. Just like life. Image Transfer Review: One might expect an independent film from 1996 to look a little ragged, but Fox has blessed Secrets and Lies with a spectacular transfer marked by deep, rich hues and astounding clarity. A relationship drama relies on a feeling of intimacy, and this razor sharp transfer plunges us so completely into the characters' lives, it sometimes feels as if we're all in the same room. Not a single speck or scratch mars the pristine print, which possesses beautiful color saturation despite a rather muted palette. Fleshtones are stable and natural, contrast is excellent, and consistently crisp close-ups add further dimension to the fine performances. This is a superb effort from Fox, and one of the best independent film transfers I've seen. Audio Transfer Review: The Dolby stereo track plays nicely across the front speakers, with subtle city noises offering a faint but effective surround feel. Some slight stereo separation adds some aural interest, and silences are devoid of any surface noise. Unfortunately, the heavy British accents can make dialogue a bit hard to decipher, but levels are strong, and conversations come through cleanly. The understated score by Andrew Dickson overwhelms at times, but enjoys good tonal depth and presence. Extras Review: The film's original theatrical trailer, and a few previews of other Fox DVD releases are the only extras offered. A multi-Oscar nominee, receiving nods for Best Picture, Actress, Supporting Actress, Director, and Original Screenplay, Secrets and Lies paints a gallery of riveting character portraits as it explores how the ties that bind can also rip us apart. Mike Leigh takes the ordinary and makes it extraordinary in a richly rewarding film that's sure to amaze and delight. Highest recommendation.